The IMF has raised its growth forecasts for 2018 and 2019. The International Monetary Fund has raised its growth forecasts for 2018 and 2019 to 3.9%, expecting the global economy to continue to recover on the back of buoyant trade and investment, as well as recent US tax reforms. Christine Lagarde, the IMF’s Managing Director, presented the brighter outlook at the World Economic Forum’s Annual Meeting in Davos on Monday. The new estimates are 0.2 percentage point higher than the IMF’s last projections in the autumn. About half of the global revision was attributed to the impact of the US tax package, which is expected to boost growth in the United States through 2020, and have a positive knock-on effect on its trading partners. “The US tax policy changes are expected to stimulate activity, with the short-term impact in the United States mostly driven by the investment response to the corporate income tax cuts,” the IMF said in the update to its World Economic Outlook. The Fund also increased its growth estimate for 2017 to 3.7%. In December, US President Trump signed sweeping changes to the US tax code, cutting the headline corporate tax rate from 35% to 21%. The policy package also reduced the repatriation tax rate for overseas earnings when they are brought back into the US. However, the IMF said that the resulting higher fiscal deficit and “temporary nature of some provisions” in the package are expected to weigh on growth from 2022 onward, offsetting some of the gains. The Fund also noted strong growth in world trade in recent months, supported by “a pickup in investment, particularly among advanced economies, and increased manufacturing output in Asia”. As a result, “growth surprises were particularly pronounced in Europe and Asia”. Germany and Japan delivered some of the biggest surprises among the advanced economies. The IMF raised its growth outlook for both by 0.5 percentage point for 2018. Germany’s economy is now expected to grow by 2.3%, while Japan’s is expected to expand by 1.2%. 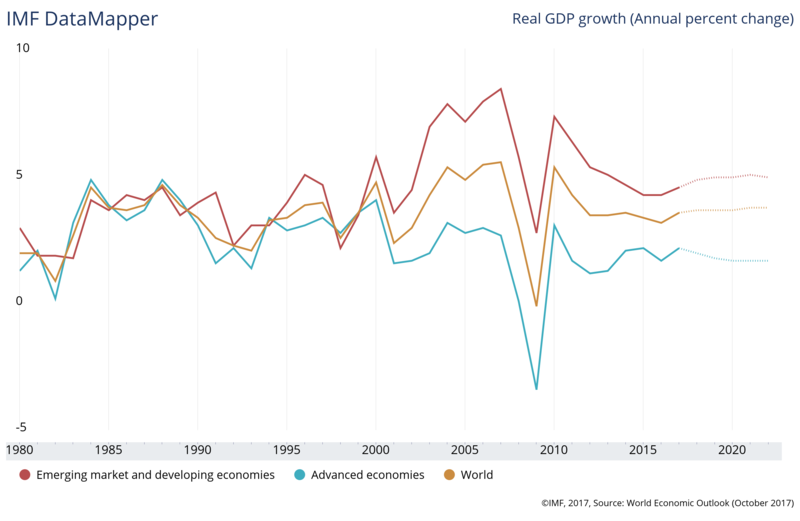 The IMF described the recovery as broad based, highlighting that “some 120 economies, accounting for three quarters of world GDP, have seen a pickup in growth”. India will be the world’s fastest-growing economy in 2018, with a projected growth rate of 7.4%. China will be in second place with an expected 6.6% expansion, slightly higher than previously thought. Among the emerging economies, Mexico and Brazil in particular are expected to perform well, with Mexico benefiting from stronger US demand, and Brazil experiencing a firmer recovery, also thanks to higher commodity prices. The IMF listed several potential threats to the recovery, including rising interest rates and higher US inflation. As for the US tax reforms, there was a risk that the investment response might be more modest than expected, which would hit demand in the US and hurt its trading partners. The Fund also warned against inward-looking policies and new trade barriers, whether in the context of the Britain’s exit negotiations with the European Union, or elsewhere.